I’m a bit late on planting my seedlings this year. Actually, I’m almost 2 months behind. It’s simply because last year – I swore off seedings. While I absolutely LOVE watching the little buds grow into veggie yielding adults – I unfortunately don’t have the room to nurture them. In the past – I’ve always kept the little guys – by the bay window on the side of the house. Just the right amount of heat and sunlight – for tomato and cucumbers to strut their stuff. However, like the George Carlin skit, I’ve acquired more “stuff” in the past 6 years I’ve been living on my own – and one of those things being house plants. I love house plants. I’m a house plant fanatic. Do I always water them – no. Do they droop from lazy neglect – sometimes. But I do love them – taking clippings and sprouting roots is what I do best. I’m a hoarder of all things house plants. On the bright side – they brighten up the dining room. On the downside – they now reside on my seedling table. Which brings me back to my first problem – no place to house my expansive and expensive seedling fixation. After spending over $50 on seeds last year (who wouldn’t need the Ultimate Pepper Hybrid?) and planting about $6 worth – I thought it would be more spending savvy to put my seedling hobby on a brief hiatus. 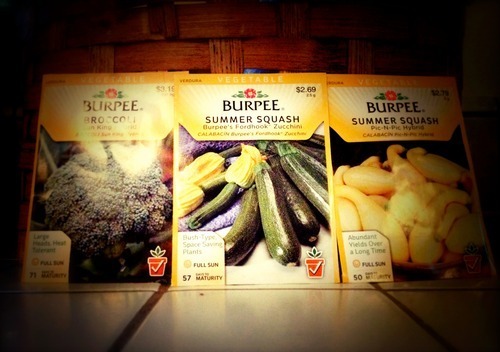 As you can see – it didn’t QUITE work – I need broccoli and at least 2 types of summer squash, darn it. But with 2 stomach sick dogs and papers to grade – it looks like wasting seeds may just be in my future again.